Patten, John. Yiddish Anarchist Bibliography . 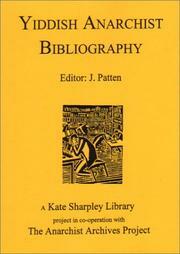 Kate Sharpley Library & Anarchist Archives Project: 1998. 32 pages, large format pamphlet, spiral bound. A listing of papers, books and pamphlets from the Yiddish-language anarchist movement, with titles in Yiddish, transliterated and translated. 9781873605271 £7.50 Only available in the U.K. Find at a local library. This work is © 1998. The author asserts his moral rights. Anarchist Voices Paul Avrich, Princeton University Press. Anarchist Portraits Paul Avrich, Princeton University Press. Fighters for Anarchism ed. Abe Bluestein, Libertarian Publications Group, New York. Fishman — W. J. Fishman, East End Jewish Radicals, Duckworth. Goncharok1 — Moshe Goncharok, Vek Voli (in Russian) [Russian Anarchism and The Jews] Jerusalem 1996. Goncharok2 — Moshe Goncharok, Tsu Der geshikte fun der anarkhistisher prese oyf yidish [On the History of the Yiddish Anarchist Press], Jerusalem, 1997. Gordin bibliography — In Gordin’s In gerangl fur frayhayt. Graham — Marcus Graham, Man! Anthology, Cienfuegos Press, 1974. Prager — Leonard Prager, Yiddish Culture In Britain, Peter Lang, 1990. Reichert — William O. Reichert, Review of Man! in Cultural Correspondances 6/7. Russian Anarchists Paul Avrich, Princeton University Press. Warwick — Warwick Guide To British Labour Periodicals 1790-1970, Harvester, Sussex, 1977. 5th Avenue & 42nd St.